The nature and purpose of synthesising human insulin. Since Banting and Best discovered the hormone, insulin in 1921. (1) diabetic patients, whose elevated sugar levels (see fig. 1) are due to impaired insulin production, have been treated with insulin derived from the pancreas glands of abattoir animals. The hormone, produced and secreted by the beta cells of the pancreas' islets of Langerhans,(2) regulates the use and storage of food, particularly carbohydrates. Fluctuations in diabetic person's blood glucose levels, compared with healthy individuals. Source: Hillson,R. - Diabetes: A beyond basics guide, pg.16. Although bovine and porcine insulin are similar to human insulin, their composition is slightly different. Consequently, a number of patients' immune systems produce antibodies against it, neutralising its actions and resulting in inflammatory responses at injection sites. Added to these adverse effects of bovine and porcine insulin, were fears of long term complications ensuing from the regular injection of a foreign substance,(3) as well as a projected decline in the production of animal derived insulin. (4) These factors led researchers to consider synthesising Humulin by inserting the insulin gene into a suitable vector, the E. coli bacterial cell, to produce an insulin that is chemically identical to its naturally produced counterpart. This has been achieved using Recombinant DNA technology. This method (see fig. 2) is a more reliable and sustainable(5) method than extracting and purifying the abattoir by-product. An overview of the recombination process. Source: Novo - Nordisk promotional brochure,pg 6. Source: Chance, R. and Frank B. - Research, development, production and safety of Biosynthetic Human Insulin. The genetic code for insulin is found in the DNA at the top of the short arm of the eleventh chromosome. It contains 153 nitrogen bases (63 in the A chain and 90 in the B chain).DNA Deoxyribolnucleic Acid), which makes up the chromosome, consists of two long intertwined helices, constructed from a chain of nucleotides, each composed of a sugar deoxyribose, a phosphate and nitrogen base. There are four different nitrogen bases, adenine, thymine, cytosine and guanine. (7) The synthesis of a particular protein such as insulin is determined by the sequence in which these bases are repeated (see fig. 4). DNA strand with the specific nucleotide sequence for Insulin chain B. Source: Based on the diagram in Watson, J.D., Gilman, M., Witkovski, J., Zoller, M. - Recombinant DNA, pg 22. Insulin synthesis from the genetic code. The double strand of the eleventh chromosome of DNA divides in two, exposing unpaired nitrogen bases which are specific to insulin production (see fig. 5). Unravelling strand of the DNA of chromosome 11, with the exposed nucleotides coding for the B chain of Insulin. Source: Based on the diagram in Watson, J.D., Gilman, M., Witkovski, J., Zoller, M. - Recombinant DNA, pg 22. Using one of the exposed DNA strands (see fig.6) as a template, messenger RNA forms in the process of transcription (see fig. 7). A single strand of DNA coding for Insulin chain B. Source: Novo-Nordisk promotional brochure, pg 13. 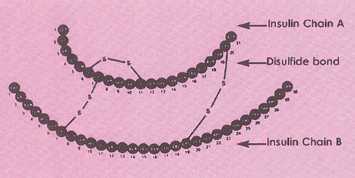 The (m) RNA strand. Source: Novo-Nordisk promotional brochure, pg 13. The role of the mRNA strand, on which the nitrogen base thymine is replaced by uracil, is to carry genetic information, such as that pertaining to insulin,from the nucleus into the cytoplasm, where it attaches to a ribosome (see fig. 8). 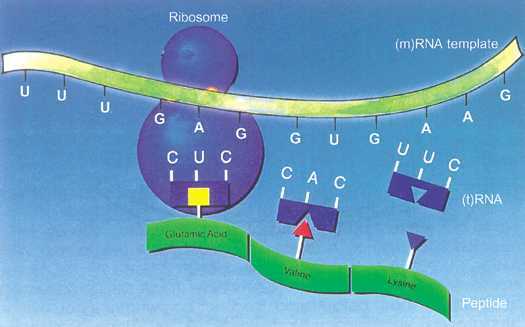 Process of translation at the Ribosome. Source: Novo-Nordisk promotional brochure, pg 13. 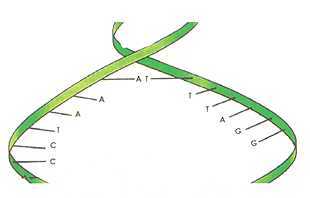 The nitrogen bases on the mRNA are grouped into threes, known as codons. Transfer RNA (tRNA) molecules, three unpaired nitrogen bases bound to a specific amino acid, collectively known as an anti-codon (see fig.9) pair with complementary bases (the codons) on the mRNA. Source: Novo-Nordisk promotional brochure, pg 13. The reading of the mRNA by the tRNA at the ribosome is known as translation. A specific chain of amino acids is formed by the tRNA following the code determined by the mRNA. The base sequence of the mRNA has been translated into an amino acid sequence which link together to form specific proteins such as insulin. 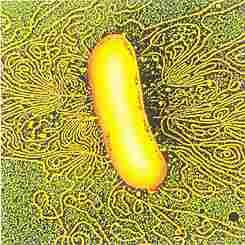 The Vector (Gram negative E. coli). A weakened strain of the common bacterium, Escherrichia coli (E. coli) (see fig. 10), an inhabitant of the human digestive tract, is the 'factory' used in the genetic engineering of insulin. The insulin is introduced into an E. coli cell such as this. Source: Novo-Nordisk promotional brochure, pg 16 . Electron micrograph of the Vector's plasmid. Source: Watson, J.D., Gilman, M., Witkovski, J., Zoller, M. - Recombinant DNA, pg 73. In E. coli, B-galactosidase is the enzyme that controls the transcription of the genes. To make the bacteria produce insulin, the insulin gene needs to be tied to this enzyme. Inside the genetic engineer's toolbox. An analogous look at Restriction enzymes. Source: CSIRO Research of Australia No. 8. This makes it possible to sever certain nitrogen base pairs and remove the section of insulin coding DNA from one organism's chromosome so that it can manufacture insulin (See fig. 13). DNA ligase is an enzyme which serves as a genetic glue, welding the sticky ends of exposed nucleotides together. Source: Watson, J.D., Gilman, M., Witkovski., Zoller, M. - Recombinant DNA, pg 78. The first step is to chemically synthesise the DNA chains that carry the specific nucleotide sequences characterising the A and B polypeptide chains of insulin (see fig. 14). Human insulin structure. Amino acid RNA to DNA conversion. Source: Genetic Engineering Activities, pg 176. 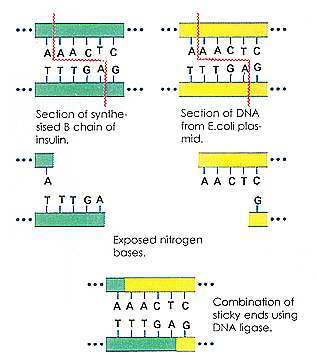 The required DNA sequence can be determined because the amino acid compositions of both chains have been charted. Sixty three nucleotides are required for synthesising the A chain and ninety for the B chain, plus a codon at the end of each chain,signalling the termination of protein synthesis. 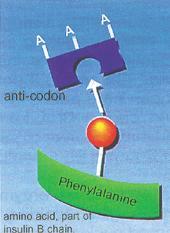 An anti-codon, incorporating the amino acid, methionine, is then placed at the beginning of each chain which allows the removal of the insulin protein from the bacterial cell's amino acids. The synthetic A and B chain 'genes' (see fig. 15) are then separately inserted into the gene for a bacterial enzyme, B-galactosidase, which is carried in the vector's plasmid. At this stage, it is crucial to ensure that the codons of the synthetic gene are compatible with those of the B-galactosidase. Source: Watson, J.D., Gilman, M.,Witkovski., Zoller, M. - Recombinant DNA, pg 456. 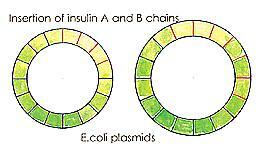 The recombinant plasmids are then introduced into E. coli cells. 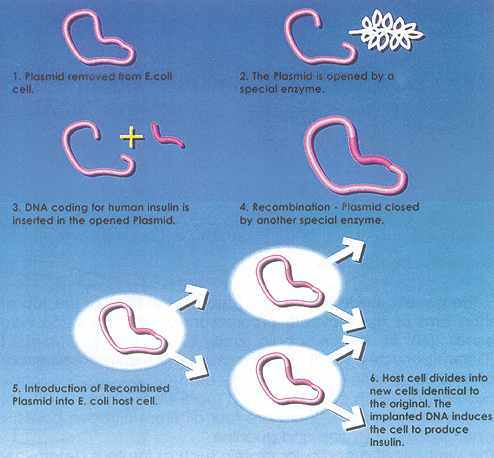 Practical use of Recombinant DNA technology in the synthesis of human insulin requires millions of copies of the bacteria whose plasmid has been combined with the insulin gene in order to yield insulin. The insulin gene is expressed as it replicates with the B-galactosidase in the cell undergoing mitosis (see fig. 16). The process of mitosis. Source: Novo-Nordisk promotional brochure, pg 11. The protein which is formed, consists partly of B-galactosidase, joined to either the A or B chain of insulin (see fig.17). The A and B chains are then extracted from the B-galactosidase fragment and purified. Source: Watson, J.D., Gilman, M., Witkovski, J., Zoller, M. - Recombinant DNA, pg 456. The two chains are mixed and reconnected in a reaction that forms the disulfide cross bridges, resulting in pure Humulin - synthetic human insulin (see fig. 18). Human insulin molecule. Source: Source: Watson, J.D., Gilman, M., Witkovski, J., Zoller, M. - Recombinant DNA, pg 456. Biological implications of genetically engineered Recombinant human insulin. 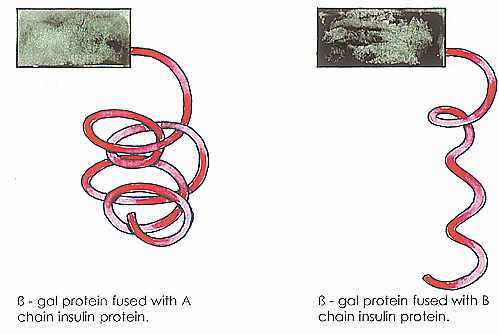 Human insulin is the only animal protein to have been made in bacteria in such a way that its structure is absolutely identical to that of the natural molecule. 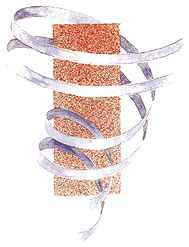 This reduces the possibility of complications resulting from antibody production. In chemical and pharmacological studies, commercially available Recombinant DNA human insulin has proven indistinguishable from pancreatic human insulin. (12) Initially the major difficulty encountered was the contamination of the final product by the host cells, increasing the risk of contamination in the fermentation broth. This danger was eradicated by the introduction of purification processes. When the final insulin product is subjected to a battery of tests, including the finest radio-immuno assay techniques,(13) no impurities can be detected. (14) The entire procedure is now performed using yeast cells as a growth medium, as they secrete an almost complete human insulin molecule with perfect three dimensional structure. This minimises the need for complex and costly purification procedures. The issue of hypoglycaemic complications in the administration of human insulin. Although the production of human insulin is unarguable welcomed by the majority of insulin dependent patients, the existence of a minority of diabetics who are unhappy with the product cannot be ignored. Although not a new drug, the insulin derived from this new method of production must continue to be studied and evaluated, to ensure that all its users have the opportunity to enjoy a complication free existence. 1. Banting - Grolier Electronic Publishing. 2. Encyclopedia of Science and Technology (McGraw-Hill). 4. Galloway, J.A. - Chemistry and Clinical Use of Insulin. 6. Insulin - Grolier Eloctronic Publishing. 7. Genetic Engineering, Compton's Interactive Encyclopedia. 10. CSIRO Research of Australia: 8 Biotechnology, pg 63. 13. HMge - Human insulin from second generation genetic engineering. 15. Price, J. - Lawsuit over human insulin looming in Britain, 26-4-92. Banting - Grolier Electronic Publishing. Charce, R.E. and Frank, B.H. - Research, Production and Safety of Biosynthetic Human Insulin, 1993. Court, Dr J. - Modern Living with Diabetes, Diabetes Australia, Melbourne, 1990. 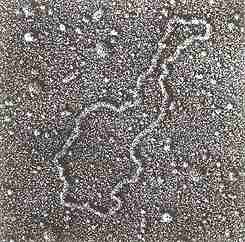 CSIRO Research of Australia No.8, Biotechnology, Canberra, 1986. Doran, P.M. - Directory in Modern Biotechnology, Hawker Brownlow Education, 1990. Encyclopedia of Science Technology, McGraw-Hill Book Company, 1987. Genetic Engineering, Compton's Interactive Encyclopedia, Compton's New Media Inc, 1994. Gillman, M. - Scientific American Books, W.H. Freeman and Co. New York, 1992. Hayward, G. - Applied Genetics, University of Bath, Thomas Nelson and Sons Ltd, Edinburgh, 1991. Hilson, Dr. R. - Diabetes, a Beyond Basics Guide, Methuen, Melbourne, 1987. Hmge - Human insulin from second generation genetic engineering, Novo. Insulin, Grolier Electronic Publishing Inc., 1992. Kammermayor K. and Clark, V. L. - Genetic Engineering Fundamentals, An introduction to Principles & Applications, Marcel Decker Inc., 1989. McCall, C. - Taming the beast of Diabetes, The Washington Times, Washington, 1992. Morris, B. (ed) - Genetic Engineering, Science in Action. Nacelle, G. J. V. and Coppel, R. L. - Reshaping Life: Key Issues in Genetic Engineering, Melbourne University Press, Melbourne, 1989. Novo-Nordisk Promotional Brochure. Recombinant DNA, Grolier Electronic Publishing., 1992. Serjeartson, Prof. S. - The Genetics of Diabetes, John Curitn School of Medical Research. Watson, J.D., Gilman, M., Witkowski, J., Zoller, M. - Recombinant DNA, Scientific American Books, New York, 1992. Wibon, J., Tooze, J. and Hetz, D. - Recombinant DNA - A Short Course, Scientific American Books USA, 1983.